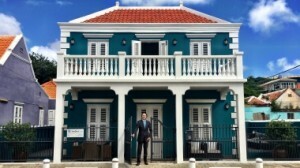 WILLEMSTAD - After a soft opening in 2016, Law Firm VanDort Law has now officially opened its offices in Curacao! Founder Peter van Dort has over 10 years experience in advising and litigating for (international) companies and individuals, mainly focusing on contracts, real estate, lease, corporate law, disputes, competition law and compliance. Peter is very much appreciated by his clients for his approach and results. His firm is personal and provides tailored solution for its clients, mainly in Curacao and Sint Maarten, but also in Aruba, Bonaire, Saba and St. Eustatius. Peter studied at the University of Antwerp and the University of Nijmegen, where he graduated in International, European and Dutch Law. He started his career in the Netherlands, where he worked as a manager of a real estate appraisal company and an attorney at law a large law firm. Peter continued his career at the oldest and largest local law firm of the Dutch Caribbean, where he, in addition to his legal practice, was tasked with setting up the law firm’s branch in Sint Maarten. VanDort Law is highly involved with its client’s interests and offers a sharp and transparent fee structure. One of its attractive alternative billing arrangement is VanDort Law’s new alternative in the legal industry: Legal Subscription. Legal Subscription provides for affordable legal services that are a convenient and predictable way to manage your legal needs. For a certain fixed monthly amount at a very attractive discount rate, VanDort Law will be available for a maximum number of hours to provide any legal advice and services. Appointments with Peter can be scheduled at the offices of VanDort Law, your offices or any other desired location that suits you best. First appointments and introductory meetings are free of charge and without any obligation.